$47.99 & FREE Shipping on orders over $59 $35. Pliny the Elder is truly an amazing beer with a cult like following. Our Pittsburg, CA warehouse is located close to the brewery and we can still only get this beer in limited quantities. However with this killer kit you can make your own Pliny and develop your own cult following where you are worshiped by your beer loving friends! Light malt color, huge hops, and a dry finish. Be prepared for an outrageous amount of flavor. This is THE original Pliny recipe, given to us directly by Vinnie. This is an intense double IPA: High bitterness with a dry malt finish, 8% alcohol, 6 separate hop brew additions, 3 separate dry hop additions, and intense hop flavor and aroma! In short, Pliny sets the standard for Double IPA's! This beer is named after Gainus Plinius Secondus, or Pliny The Elder, a Roman author, lawyer, naval man and naturalist who first mentions the botanical name for hops in his writings - lupus salictarius, which translated from latin means Wolf Among Willows. Sadly, Pliny died while helping people escape the eruption of Mt. Vesuvius in August, 79 AD. Pliny the Younger was the nephew of Pliny the Elder and is the name of another outrageous and highly sought after beer from Russian River. If you have not tasted beers from Russian River Brewing Company, you should. This is a brewery with huge demand that keeps quality as a first priority. Owner Vinnie Cilurzo is also unique in that he still actively brews and tests recipes and ingredients (on a MoreBeer! Brewsculpture by the way) on a constant basis. Amazing. Please Note: the recipe sheet you recieve with the kit may list the 2oz of whole hops as a boil addition. However, the whole hops should instead be added directly to your mash tun with your grains when you mash-in. Comes out exactly like PTE in a side-by-side. Love the original and I want to recreate it. Can't buy it? Brew it! Iâ€™ve always wanted to taste this beer. Now I can make it! I liked beer. I still like beer. Lots of good reviews, wanted to give it a try. Like this beer & have wanted to brew myself and this is a great deal & opportunity to so so. Hands down; the best IPA ever. I went to the brewery and had the beer. I want the recipe to brew for myself anytime I want, instead of standing in line for 3 hours. Looked interesting and like the Original beer it's a clone of. excellent beer and made it before! Tastiest kit I've ever had. heard about the beer. never had it. Can't beat Pliny for a double IPA and this one is closest to the original. How many pounds of grain in this kit? BEST ANSWER: The kit uses 14 1/2 pounds of grain and one pound of corn sugar. There are also 14 oz. of hops in the recipe. I used the kit for the first few batches then started buying the ingredients locally. This is one of my favorite beers and I always keep it on hand. It tastes just like the original. Are there all grain instructions? BEST ANSWER: Hi Timothy - We have emailed you a copy of the instructions. So I got the all grain kit and received the extract instructions. Tank goodness I have done enough brews to know what to do but would it be possible to include the all grain instructions with the all grain kit? I am mashing at 152 (has to guess) so hope this is right. Already did the yeast starter and need to do this tonight, so I hope it turns out right. The recipe is not posted for some reason. I wanted to know if this kit uses Cascade hops? BEST ANSWER: Hi Charles - Thank you for pointing that out, we will be sure to add the recipe onto the webpage. 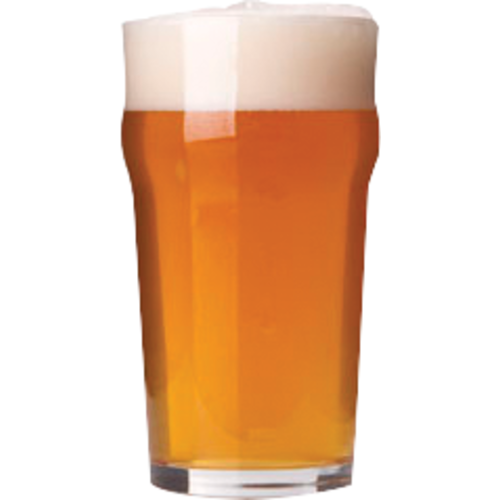 This website (https://www.homebrewtalk.com/forum/threads/morebeer-pliny-the-elder-instructions-confusion.302620/) contains the recipe sheet. It's towards the middle of the page. Only the extract recipe is given at that web address. How about the all-grain recipe? It's available at the AHA website, but I'd like to know if MoreBeer follows the same recipe. Even better, post on the MoreBeer webpage as the "best answer"said you would. Thanks! Hi Roy - I have sent you an email regarding the kit instructions. Can I get this in a 2.5 or 3 gal kit? If not, is it possible to get the recipe so I can build one on my own? I make mostly small batches because a 5 Gal batch lasts too long and I can try more variety with the smaller batches. BEST ANSWER: Hi William - Unfortunately we do not carry this kit as a 2.5 or 3 gal batch. Please email us at info@moreflavor.com for the recipe. Brewtarget (http://www.brewtarget.org/) is a great tool for scaling batches up or down. One of my favorite clone kits. A tasty beer even before dry hopping (icing on the cake). Very close to the real thing. Actually amazing close. Mine came out a little "thinner" and a little bit more aggressive jo flavor. But we taste tested side by side with the real thing and it was very cool to taste how close it was. Cheers. Enjoying the brew now and it's great! If you are making IPA's and can't seem to get the aroma you're looking for. This recipe will open your eyes to the amount of hops that are necessary for a West Coast Style IPA. We were way low on the hop additions comparatively speaking. They are not lying about this being a clone either. Our beer looks like a Pliny, smells like a Pliny, and even initially tastes like a Pliny. It just doesn't finish like a Pliny. I expect that is mostly due to the yeast. We used the GigaYeast NorCal. We will continue to use the technique in the recipe to tweak other recipes that we have made. I was able to compare with a fairly fresh Pliny multiple times over a month and it’s close to the original. It is probably too hard to duplicate the exact product considering we all have different processes and water profiles. It was my first experience using wet hops. Quite messy. My beer was darker than the Pliny and a little muted hops in comparison, but that’s an issue on my end to resolve. The hop flavor and aroma declines fast so having mine in a bottle delayed my peak enjoyment. I would highly recommend kegging this recipe if you can due to the short shelf life of the hop goodness. You really notice it on a hop monster like this. Shipment and ingredients packaged nice. Fast free shipping is nice too. Pricey kit, but it tastes GREAT!!!! I've brewed this several times, and each time it's been great! 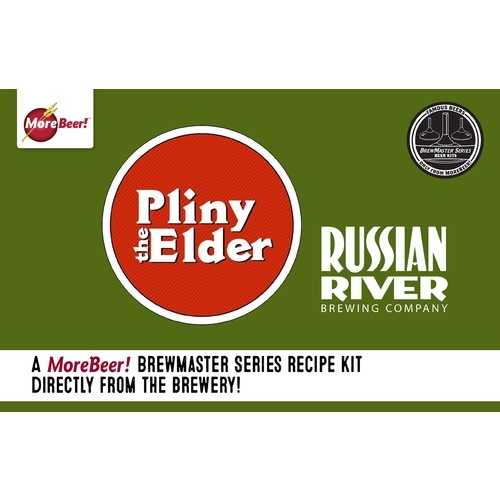 I've never had the opportunity to have an actual bottle of Russian River's Pliny the Elder, but I can't imagine it being much tastier than what you can brew with this kit. Been brewing for over 10 years and this is by far the best batch I've made. I haven't done a side-by-side with the real thing yet, but I will definitely brew this again. This kit was received in excellent condition. I was surprised at how much grain there was and then I started sorting the hops! Mash hops, boil hops, no boil hops, and dry hopping hops! More hops than I have ever used in any of my previous batches. Can’t wait to taste the finished product. The cooled unfermented wort was delicious! I am a novice brewer, but have winemaking experience, so I understand process. My first 2 Pliny batches were malt extract. While a very respectable product, I felt it was a bit too malt forward for a DIPA. Third time was a charm - all grain! The steeping was straight forward and the wort smelled so much better than the malt extract kits! FAST, aggressive fermentation, dry hopping and racking complete and beer is currently in the keg and came in at 8.1% ABV. The result is truly OUTSTANDING! I will FOREVER be an all grain brewer! Thank you, MoreBeer! Great to hear your results and progression! It’s a great brew. I modify it, as I don’t find adding hops to the mash ton too helpful. At that temperature you are mostly only getting very volatile aroma oils out which get boiled off. I like to all the whole hops at flame out during my whirlpool for better aroma and flavor. Loved this kit! Brewed 2 kits for 10 gallons. Used the white labs California ale yeast and it came out great. Kegged it 17 days after brewing it and it finished at 8.6% ABV. Will buy again for sure! One of the best West Coast Double IPA kits you can buy! in the spirit of Pliny and really good. I like throwing some carafa special into it and making a killer black ipa. What a great clone. This is an amazing beer that I will for sure buy and brew again. Lots of hops, smooth, and hot; simply great. Buy it. Hard to beat for the IPA lover! What can I say? If you have tried and like Pliny The Elder, this is a spot on recipe. The only thing better is Pliny The Younger (IMHO) and that is not available that often. I have brewed this recipe twice now, both times it came out very good, very aromatic and smooth, people who tasted it couldn't believe it was a double IPA at 8.5% ABV where mine came in at most recently. I have never had the actual pliney but regardless if you like hoppy beers it's definitely worth Brewing. Cheers! Love Pliny, great beer and hop taste and aroma. I am not sure if it was my brewing skills or what but this did not come close. first time I have ever had hops in the mash? wonder if something was not right. Instructions were not specific on this. This is a great recipe. Even with the minor modifications the beer is awesome. Never expected it to be so 'not overwhelming'. I kind of burned out on IPA's a few years back but this brew that I made for my son-in-law has brought me back around. Thanks Vinny! I've brewed about a dozen Pliny clones from various sources the past few years. They are all phenomenal beers. This is the first time I've done the "real deal' from Vinny himself. Of course it's a great IPA and much closer to the real thing than any of the other clones I've made but it's not quite the same. The bitterness malt, nose, and head are spot on. The Real Thing MIGHT have a bit more malt character. Just like all the other recipes I've brewed, the color is darker than the original. The original is quite pale while this is more amber. Note: I used Gigayeast Vermont IPA yeast. I usually use US05. I'd give it 5 stars if this were simply a generic double IPA.But one star deducted for not getting the color right. Truly an antidote to the new england haze fad. That lupulin addiction kicks in and you really have a hard time drinking in moderation. Really, if I could brew only one recipe, this may very well be it. Viinnie lets the dry hops sit for a week or more. I did 3 days. Aged two weeks before tapping. Lots of hops makes the transfer to keg a messy proposition and it's not the most economical brew...but the results are top notch. This was by far the best DIPA I have ever brewed!! I lost 1.3 gallons of wort due to hop residue flowing out of the kettle after cooling....this is a lot more than usual with my set up and I guess I shouldn't have been surprised with 6 ounces of pellet hops in the boil. I racked the clear wort to a second fermenter before adding the yeast. Has this been the experience with others that have brewed this beer? In a side by side test, the real Pliny is better. With that being said, it's a solid recipe and makes a very good beer. And c'mon.... doing taste tests are fun. The Pliny the Elder All Grain Kit is easily in my top three recipes. I have used this kit four times with outstanding results each time. The kits have had excellent ingredients, which were well packaged and shipped quickly; what's not to like! I've done the extract version of this kit several times but this was my first all grain attempt. This is such a fun beer to brew. The extract version has always been my best brew. I have high hopes for this one. "Indeed, what is there that does not appear marvelous when it comes to our knowledge for the first time? How many things, too, are looked upon as quite impossible until they have actually been effected?" Book VII, sec. 6. What is there indeed! This recipie and kit really opened my eyes to what is possible in my garage. Though I have brewed more than a few passable beers, this was the first one I was anxious to have others try - it's really that good! Brewing it allowed me to put my new found knowledge of water chemistry, the mashing process and packaging to the test and it has really paid off. At a local tasting room it was placed in the lineup along side a number of wonderful commercial examples and after it was revealed as Homebrew, more than a few people asked if I had more. That's some pretty serious validation after only a few days in the keg! Excellent kit that's well worth the money and effort. Is it as good as the real thing? IMHO side by side it's obviously different... That said, it's pretty darn good - best beer I've made yet! Amazing beer, lacking on direction. As others have noted, the directions that are included are very minimal. An average to experienced homebrewer can make some assumptions and get it to turn out amazing, but a beginner would be clueless. Overall it turned out great and tastes amazing. Awesome kit for the price. I will be brewing this many times in the furture. I bought and made this after a trip to California where I was finally able to have Pliny on tap! It is a phenomenal kit and everyone who tried it loved it. This is simply an awesome brew, and very authentic according to Vinnie's original article where he published the recipe. I'm certain it's the best thing I've ever brewed. I kegged half and bottled half and both were sensational. The aroma is spectacular, the malt is substantial enough to balance the huge hopping schedule, and the alcohol presence is well-managed, even at 8.5%. This will now be a house brew. I recommend it highly. Am I better than Vinnie? Of course not! But I've brewed both all-grain and extract kits and in each case, my kit result was favored (albeit slightly) over the real deal in blind tastings by my family. I can't vouch for the age of the real deal, but it tends to sell quickly so I have to assume it's not too old. This is a great recipe and will not disappoint. How many 9% beers did you want to keep drinking? I've made this kit twice now and without exception, every person who's tried it has said it's the best beer I ever made. Even people who typically avoid big beers can't seem to stop drinking this stuff. The flavors are so diverse and come and go so quickly, it's like your brain says "Hey, send some more of that down so I can figure out what all those flavors were." :D Mine was a bit too efficient the first time and ended up at almost 9%, so I backed off some of the corn sugar the second time and my second batch is 8.2% like it's supposed to be. My municipal water is fairly soft, so I had to add a decent amount of minerals to the mash and sparge waters in order to get the hop flavors/aromas to pop. The beer is simply dynamite. I used some DAP yeast nutrient to get a good attenuation in a reasonable amount of time. Both my batches ended at 1.016. I found this beer to be like many IPA's, somewhat better young than older. Thankfully it didn't last long. One for the record books!! All-grain kit. Brewed 10/06/14. Kegged 11/10/14. Sampled 11/20/14. I've never had an original Pliny, and living in Ohio it's doubtful I will any time soon, but if this is close then I can understand the hype. This is one great brew. It has everything a trueblooded hophead could ever crave. Has to be one of the top 5 beers I've ever brewed. Can't wait to get some to my friends and get their opinions! I'm sure they'll love it too!! I have only been brewing since Nov. 2013, and I made the jump to all grain in February. This was the first all grain IPA I brewed, and it is out of this world. All of my friend tell me that this is the best beer that I've made so far, so a huge thanks to MoreBeer for making this available. Will keep this in the rotation, for sure. I have brewed the all-grain version of this recipe (BIAB) three times now; I love it, the aroma, the color, the taste! I just had my first REAL Pliny last night and I must say this recipe is spot-on! I'll be brewing this one regularly. I have never had the pleasure of drinking an actual Pliny the Elder and I am sure that my version was not near as good, but what I got was incredible. 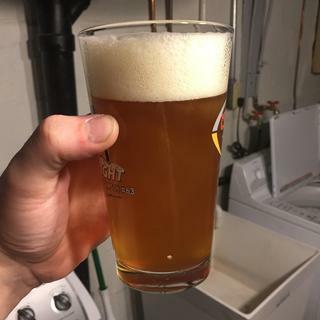 Easy and fun to brew, you have to work at this one, I was excited to use whole hops in the mash and all the hop addition and finally the dry hopping. I mashed a little high, so I will drop the temp a few degrees next time, (there will be lots of next times), but the finished product is perfectly hopped, with a dry finish. Can't wait to try the real thing, but in the mean time, I will keep on brewing this one. A great IPA with plenty of hop flavor! Brewed this up...(recommend a real understanding of all grain brewing as the instructions assume you have skills) and placed it side by side in blind taste test with Pliny drinkers. Went about 50/50. Color is perfect, as well as aroma and mouth feel. Pliny has a slight malty tone that was lacking in the kit, but that may have been due to my mash...although OG was right on. Super good. The multiple additions of hops really make it. Be sterile in the hop additions... don't let a bag "float" in the brew. Weight it down with marbles to get the best essence and avoid mold! My go to Beer that satisfies advanced beer drinkers Palate's. I got mine to match up very closely to Vinnies Brew Pubs tap flavor. Excellent kit that is a must brew. Something went wrong with mine, maybe the crush? This is the first recipe I have done from morebeer and unfortunately I missed my numbers by a ton! I have only done a few AG recipes but I suspected the crush wasn't very fine before I began. I weighed out everything prior to starting and all the ingredients were good. I did a 60 min mash at 151. My post-boil O.G. was around 1.044, no where near the 1.072+. My first runnings volume was low about 2 qts but I figured that could be due to the absorption of the whole hops in the mash and my absorption factor being off some. I also wondered if I calculated something wrong because I hadn't done a 90 min boil before. I ran my numbers through two other batch sparge calculators online and they matched with the process I used. At this point I think it was likely the crush. I will be sure to mill my own in the future. I guess I will see what I end up with in a couple weeks, but it won't be a Pliny. Hopefully it's still a good beer and not too bitter. This is by far the best kit that I've made to date. Brewed a 10 gal batch and tried it next to the original... both were very good and very similar, I imagine some of the difference has to do with procedure/temps and water chemistry. Honestly, I liked my version better. It seems like the bitterness is a little bit smoother and more full mouthfeel. I could drink this all day, every day. I would not change a thing, and I will be brewing this again very soon. The recipe itself is phenomenal. An extremely balanced and delicious IPA that I'll certainly re-brew. However, my kit came with poor instructions and they could certainly be improved. The only thing offered in the kit was a boil schedule; however, it did not mention anything about mash time/temp, mashing out or skipping mash out, and did not mention anything about preferred sparging method/temp/volume. Mash In: Infuse 20 quarts @ 163F for a mash temp of 152F. Mash for 60 minutes. Getting ready to brew this tomorrow and this is exactly the info I was looking for! Thanks! I have never had Pliny, so I can't say how close this kit is, but this is as good as any IPA I've had (or better). My OG was a bit low, mash temp a little high but still over 7% ABV and very drinkable. Two weeks in primary, 7 days dry hopping in secondary, 10 days in the bottle and yum! One month to brew the best beer I've made yet. Can't beat it. Morebeer kits are awesome! I've brewed this kit three times now and I have to see it's pretty close to the actual Pliny The Elder. Mash hopping two ounces of whole leaf Cascade is a beautiful thing. My garage smelled like heaven. Does the kit come with instructions for mash target temp/time and hop schedule? This is a good solid beer. This recipe needs no tweaking. It comes out perfect. Although I never had the original Pliny, ( live in FL) it is a perfectly balanced IPA. I would recommend this kit to anyone who likes hoppy beers. I think I'm going to grab one right now!